Before Travis Tober was old enough to drive he was already pouring beer at a pub his parents owned in Buffalo, New York. After high school, he intended to become a cop but realized the Police Academy wasn't his cup of tea. Instead, he continued to pursue bartending, a profession that led him to do stints in West Palm Beach and Las Vegas. 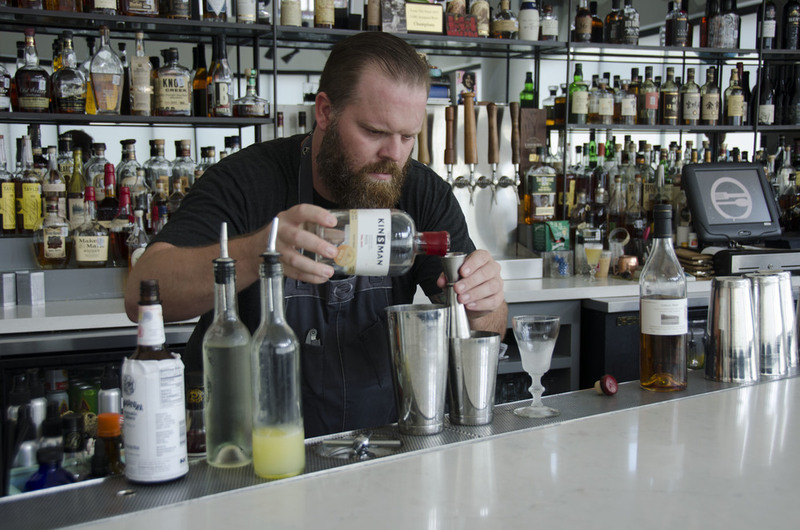 In 2011, he made his way to Austin, becoming one of the top bartenders in the state. He's garnered several accolades, including being named the People's Choice winner in the Official Drink of Austin competition and the People's Choice winner at Bacardi's Hand Shaken Daiquiri at Tales of the Cocktail in 2012. Tober, who also has served as the vice president for the U.S. Bartenders Guild Austin Chapter, is the beverage director at Vox Table. There, he has cultivated a thoughtful, fun cocktail program that features Kinsman Rakia, a spirit he calls "the most beautiful spirit distilled in Texas." I grew up in Buffalo, New York. My parents owned this dive bar, sort of like a cafe and pool hall, so I literally poured my first beer when I was 13 or 14. I basically grew up in restaurants and pubs. My very first job was as a dishwasher and bar back. I worked my way up from there and started bartending when I was 18. At that time I was also going to college and thinking about going to the Police Academy but decide that wasn't for me. I made good money as a bartender, and I really enjoyed what I did and had a great time. What's your approach to bartending? My whole ideal is to give the restaurant, bar and cocktails their own identity. You can come to get great food but you can also get great cocktails. For many places, you're known for one or the other. Consistency is the main thing. It's got to be fun and taste great. If you order a Negroni, it has to be the same down the line. I like fun names and great, fresh ingredients. You know, things that really stand out. Seriously, me and all my bartenders say that it's the most beautiful spirit distilled in Texas. It's amazing. It's super clean and crisp. I've had other people taste it and say it's one of the best apricot brandies out there and it's made, of all places, in San Antonio, Texas. It's subtle. It doesn't overpower and it doesn't have a fake taste to it. I say it's beautiful because that's exactly what it is. I think it's definitely one of the best spirits out there. I really like to use fresh citrus. Peach goes really well. Anything herbaceous, too. Like Chartreuse will make it pop. Instructions: Combine ingredients except bitters into a cocktail shaker. Dry shake without ice. Add ice and shake vigorously to further emulsify egg white. Strain into a chilled coupe. Top with bitters.